The Chow Chow is a medium sized breed of independent Chinese dogs. This breed is well known for its dignified behavior and appreciates when it is treated with respect. This breed is known to be independent as well, living alongside its owners like another member of the house. It particularly does not like being pampered, and will dislike the idea of assuming the role of a lap dog. Chows are notoriously very suspicious of strangers. They will only accept a new person’s presence if they are introduced formally by the owner. Chow Chows will give strangers the cold shoulder, giving them little to no attention. If they believe a stranger is trespassing, however, the dog will greet them with the intention of protecting their owner, displaying their fierce loyalty. This breed is not known for being very vocal. At most they may bark when alerted, or excited, but otherwise they remain fairly aloof. This makes them better dogs for people who have neighbors sensitive to volumes, but they often are not suited for apartments. Chow Chows are compared to cats in their quiet, independent nature. Chows are not recommended dogs for families with young children. They can only coexist well with people that understand their boundaries as dogs, not pulling on tails or ears. Teenagers can typically handle the dog well, but it’s best if the dog grows up with them, given their natural suspicion of strangers. It may be more difficult having their friends coming and going through the house, however, so they are not great family dogs altogether. This breed is not a good one for sharing the house with other pets. Their lacking social skills make them unlikely to make new friends, nor play nicely. There’s a possibility that a Chow would be protective of their owner from the other pets too. If anything, if they are coexisting with other pets, it’s best that they are raised together. This way the dog is familiar with the other pets, and may be more social. These dogs are also not known to be very energetic. They prefer to be quietly relaxing around their home or keeping watch over their owner’s property. Their dignified behavior paired with their lack of social ease makes them reluctant to be cuddled and adored excessively. They can be playful dogs, however, which can help get them the exercise they need to stay healthy. 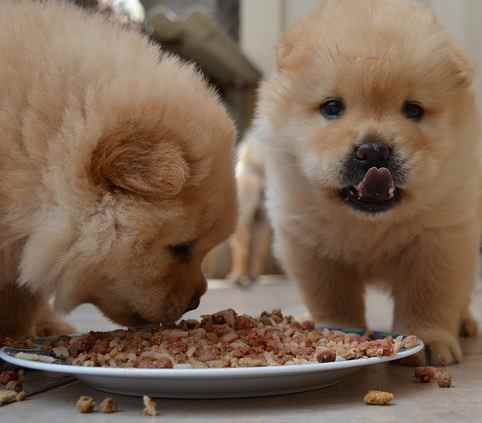 Despite their dignified personalities, Chow Chows aren’t too picky about what they eat. Their medium size and weight makes them suitable for dog foods of those types. Workers at pet stores can often give advice on the right food for a dog. While they aren’t picky, they aren’t heavy eaters either, so they aren’t prone to too much weight gain. Given that the Chow Chow is so independent, it can handle spending time on its own. Unlike dogs that are prone to separation anxiety, Chow Chows typically exist just fine when away from their owner. This makes them ideal for owners that won’t be home all day. The origins of the Chow begin in China, although, that’s not where they get their name. Instead of the names given to them by the people of their home country, they have adopted the name given to them as British cargo. In China, they have deep roots as the “fluffy lion dog”, and played a couple roles in ancient society. In China, Chow Chows were everything from royal hunting dogs to guards of temples. The oldest depictions of these dogs reach back to the time of the Han Dynasty. When they weren’t hunting or guarding, they saw some less enjoyable occupations. Their skin was considered a delicacy in Asia, and their coats were shaved to be used in clothing. The Chow Chow remained a popular breed in their home of China and did not spread out from Asia for a long time. They spread alongside Mongolian armies that were moving into Europe. It’s likely that the breed originated in Mongolia, but it’s also possible that they came from Russia and Siberia. This breed was depicted in British books in the 1700s, and by the late 1800s, it had made its way into western Europe. They got a lot of attention in Britain, where they were displayed in zoological exhibits. Later, they gained more popularity as pets when Queen Victoria a Chow Chow as a gift in 1865. Soon, in 1895, the Chow found itself with its own breed club in Britain. The breed was gaining much popularity in the country, and soon it would spread into the western hemisphere. The first Chow in the US, the Chinese Chum, introduced the breed to the country, which soon adopted it. This same Chinese Chum found himself the winner of the Best in Breed at the Westminster Dog Show in 1906. The breed remained fairly rare in the US. Meanwhile, it maintained a somewhat steady following in Europe. It saw more of a popularity boost in the years following WWII, as with most breeds. Families could now afford luxuries such as domestic pets, which led to a widespread increase in the pet population. The Chow was registered by the AKC in 1903. 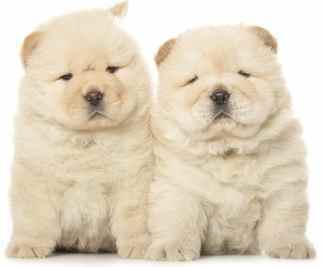 In 2015, the Chow Chow was 68th in popularity with the American Kennel Club. The Chow is a notoriously difficult breed to train. Given their independent and aloof personalities, owners often have difficulty commanding their attention. Owners have to establish that they are in charge, and often take their dogs to obedience classes to make the training process easier. It’s paramount for these dogs to be socialized young, as they are naturally suspicious of strangers. Exposing them to other pets, people, and things by taking them on walks or to obedience classes will make them more comfortable in their environment. These are not ideal dogs for living in areas of high population density, as it will only make them more nervous. Housebreaking a Chow is not a difficult task once the dog’s attention has been acquired. It’s recommended that these dogs do have an enclosure when outside, as they will be very protective of their property. A fence is the best way to keep things out and the dog in, although owners use invisible fences as well. The most efficient way to train these dogs is through consistent positive reinforcement. Despite their dignified attitude, Chows are sensitive. They won’t respond well to scolding, and will instead become less responsive and reluctant to learn. Praising accomplishments push the dog to strive for its owner’s appreciation with good behavior. Although Chows look like cuddly teddy bears, they are not your common huggable breed. They are independent and make excellent guard dogs. They need a strong owner who will provide the training and socialization needed for this protective type dog. If raised with children and other dogs, they will be tolerant of them, but if not, beware, these dogs can be dangerous. 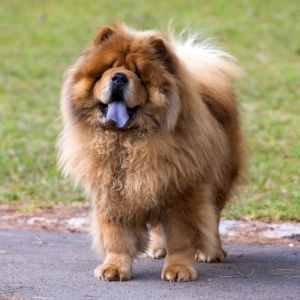 A Chow’s size, along with their ferocious bark and show of teeth is likely to scare off any would-be intruders. Since this can be a problem even for friendly strangers, the responsible owner will assure that they can control their dog at all times. Chow Puppies are born with pink tongues that gradually change color. By the time they are 8 weeks old, their tongues are blue-black. The only other dog breed that has a dark tongue is the Chinese Shar-Pei. Maintaining a Chow’s coat makes them a challenging dog to groom. Their thick, fluffy coat comes in two types, rough and smooth. The rough coat shows off a fluffy mane of fur, like a parka. The smooth coat is more dense and hard, with feathering not covering their whole bodies. The rough coat is undoubtedly harder to groom, with its excess of hair. Both the rough and smooth coats require regular brushing to remove shed hair and odorous particles. It’s recommended that Chows be brushed at least 3 times a week, and bathed monthly. These dogs shed seasonally, so owners compensate the frequency of brushing accordingly. Even though they only shed twice a year, those periods of time when shedding occurs can be very challenging. You could save enough loose hair to make a sweater during those times! 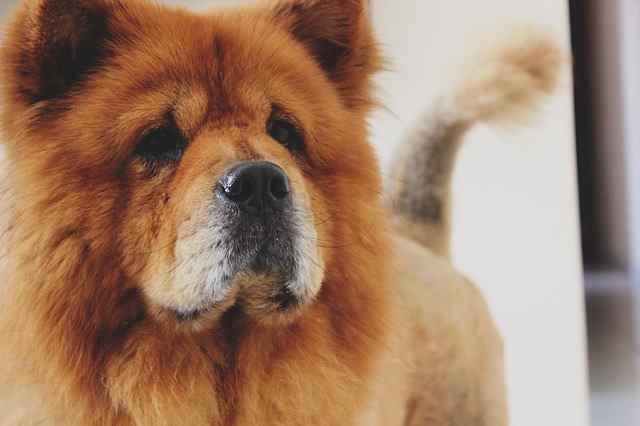 Since Chow Chows need so much brushing, it is highly recommended to train your Chow to cooperate during grooming sessions. The easiest way to brush their hair is when they are lying on their side. That way they are comfortable and relaxed during the long grooming sessions. If this is the breed of your dreams, plan to spend some money on good quality grooming tools. At a minimum, you will need a slicker brush, pin brush, good quality greyhound stainless steel comb, and a pair of grooming scissors. These tools are for the hair only and don’t include items such as nail clippers and toothbrushes. All dogs are likely to be affected by some sort of health issue at some point in their lives. However, certain breeds are more disposed to to certain health conditions than others. It’s important to take the health problems associated with a breed into consideration when buying one. It’s important that a dog is purchased from a reputable breeder as well. A good breeder will know a lot about the breed and be able to pass health checks for their dogs. We always recommend that you research your potential breed until you feel confident that the dog is right for you. These books are a helpful start. Talk to breeders and dog owners to get a better understanding of what it is like to live with these amazing dogs. Click on the images below to for more information.